“Let’s Go!” Once more, The Three Mosquitoes familiar battle cry rings out over the western front and the three khaki Spads take to the air, each sporting the famous Mosquito insignia. In the cockpits sat three warriors who were known wherever men flew as the greatest and most hell raising trio of aces ever to blaze their way through overwhelming odds—always in front was Kirby, their impetuous young leader. Flanking him on either side were the mild-eyed and corpulent Shorty Carn, and lanky Travis, the eldest and wisest Mosquito. Were back with the third of three Three Mosquitoes stories we’re presenting this month. This week Kirby is hand-picked to to currier valuble war plans from Paris to Colonel Drake at his own drome. Sounds easy enough—but nothing is ever easy when there are more spys from imperial inteligence than frenchmen on the route. And Kirby is told he must either deliver the plans or make sure they are utterly destroyed if they fall into enemy hands! 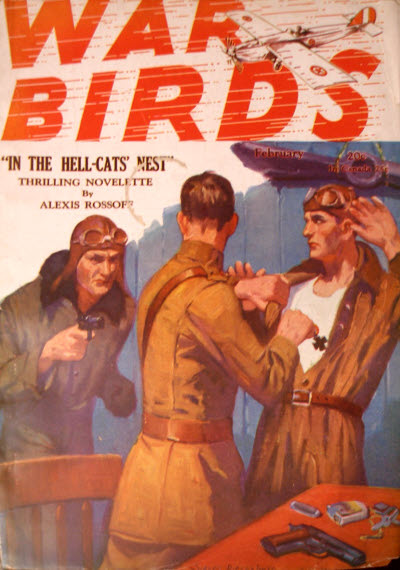 It’s another exciting tale of Ralph Oppenheim’s The Three Mosquitoes that originally ran in the February 1929 number of War Birds magazine! That simple mission that Kirby was on suddenly turned into a seething cauldron of intrigue and mystery. Death and the sinister shadows of the Imperial Intelligence crossed his path, and there was the wily von Hertz who always did the unexpected.